Vintage toys are always fun! Sock Monkey pops up just like the classic toy! The Sock Monkey Jack-in-the-Box plays the "Pop Goes the Weasel" song. The perfect gift for kids of all ages! 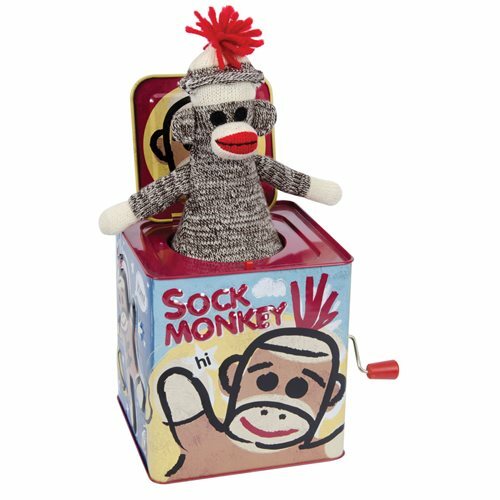 Play "Pop Goes the Weasel" in sock-monkey style with this Sock Monkey Jack-in-the-Box. Standing 5 1/ 2-inches tall, it includes a plush puppet that pops out when the handle on the side of the box is cranked... just like the classic toy we loved as kids! Contained within an embossed tin that sports cool designs like Sock Monkey floating among the stars, and another where he's saying and waving hello while standing next to the sun, the Sock Monkey Jack-in-the-Box is the perfect gift for kids of all ages! Ages 1.5 and up.